Hello there. This past month was busy, and I confess the end of expansion lull has me logging on a bit less these days, so I’ve not been as diligent in my blogging as perhaps I should. To get back into the swing of things, this week’s recreation is fairly straight forward. This sign with its large planetary graphic is probably most familiar to Republic players who keep up with the Black Hole Weekly since it can be seen by the irradiated zone near the Hyper Matter Tower. It also can be found elsewhere around the galaxy and as a stronghold decoration. The sign’s content and layout echo numerous others around the game. The use of prominent and seemingly random double letters is common element in many, many, many other signs we’ve seen, as is the featured use of the “D” glyph, Dorn. The planet symbol is also a recurring motif. The awkward English translation is also not uncommon. Threepio is most assuredly disappointed, but this sort of thing must be expected when working with alien languages. That said, even the Aurebesh on display here is somewhat distorted. The “Q” glyph, Qek has been slightly truncated with the downward stroke on the right side of the letter trimmed off, probably to make it fit on the sign. 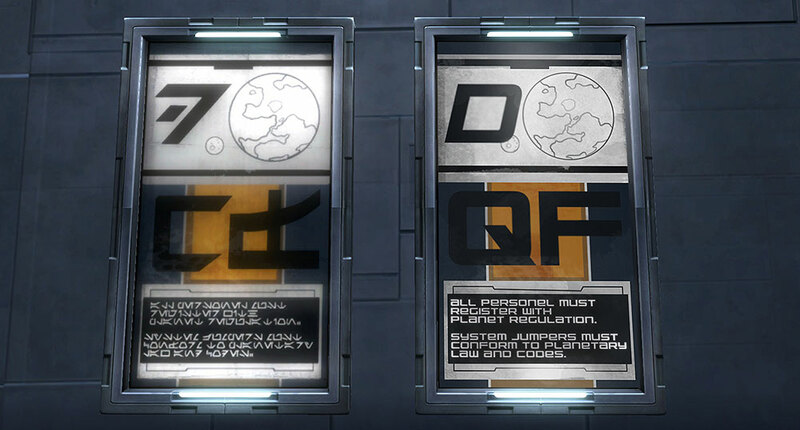 The kerning of the original Aurebesh font is pretty sloppy, so reshaping letters for design reasons seems fair. There has been a flurry of Star Wars news recently, and I thought I’d toss in my two truguts. 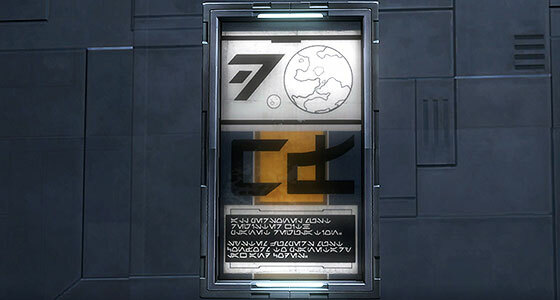 First up, SWTOR released game update 5.7: Legacy of the Creators. The Scyva encounter is neat and not too rough on storymode. If you can do Nahut, learning Scyva should be easy. Since I’ve only completed the Fallen Empire story on two characters, neither of which are a Smuggler or Inquisitor, I have not yet tried the new story content. That I haven’t been running all my characters through the story should not be taken as criticism. I think Breaking Bad is one of the best TV shows ever made, but I’ve still only seen most episodes once. When it comes to alts, I tend to run through the story super-duper casually: maybe a chapter once a week, sometimes not even on the same character. I’m happy to run stuff at my own pace, and I’m not ever going to spacebar-mash my way through just to be caught up. However, my story main is my Consular, and she is definitely feeling a little left out, but I’m certain Tharan Cedrax’s return will be EPIC. In the meantime, I am eagerly anticipating the next road map. This week also saw the reveal of the long awaited or perhaps over-due trailer for Solo: A Star Wars Story. I won’t go too deep, since predicting anything about a movie from its trailer is a fool’s errand. Any Star Wars fan with access to the internet knows that this movie has seen more than its fair share of behind the scenes drama, and I’m reluctant to get too hyped about a movie that may turn out to be a total mess. My expectations are not high, but Ron Howard is a reliable and experienced director who knows how to work within different genres, so I’m not without hope. I’m also down with Alden Ehrenreich. He looks as much like Harrison Ford as River Phoenix did, and what snippets of him we get in the trailer do seem to capture Han Solo’s mix of cockiness and dumb-assery, so I’ve got no issue there. And, c’mon, Donald Glover as Lando? Hell, yes. And, if nothing else, the trailer confirms that the Terror from Beyond is canon. Finally, it was also announced that David Benioff and D.B Weiss will be writing and producing some Star Wars movies. As a long time Game of Thrones hate watcher, I’m less than psyched, but I can see why they might be appropriate picks for a big franchise like this. There are a lot of Star Wars stories out there, and I don’t have to love them all. I’ll like what I like, and not worry about the rest.